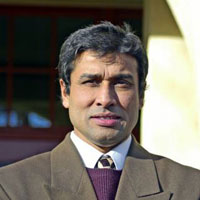 Dr. Ashok Ghosh, associate professor of mechanical engineering at NMT, is the guest speaker for the N.lM. Society of Professional Engineers luncheon. He will speak about his recent participation in the U.S. Alumni Thematic International Exchange Seminar (Alumni TIES) on "Stronger American Cities: Closing the Skills Gap and Building Entrepreneurial Ecosystem." Ghosh had the opportunity to share thoughts with 40 other alumni representing various parts of U.S. on the role that local and national governments will play to develop programs that target complex societal issues. One such issue is the impact of loss of jobs due to the retirement of San Juan Generating Station in 2022 on the economic development of Farmington. Dr. Ghosh is the president elect of the New Mexico chapter of the S.P.E. and a Fulbright Scholar. This luncheon is at 11:45 a.m. at Romano's Macaroni Grill, 2100 Louisiana Blvd. NE, Albuquerque. Cost is $30. RSVP by Monday, April 22. Registration is available online at NMSPE.org or by email to NMSPE.abq@gmail.com.